A strip of silver and gold, cut in spirals from a flat sheet of hammered bimetal, becomes a tangle, becomes a brooch all without losing sight of the original, quiescent metallic sheet. To look at one of her spiral brooches is to glimpse the hidden personality of the metal that has, for the moment, assumed a fresh form. Ishivama’s respect for metal goes hack to her childhood. Until age ten, she lived in a village of craftspeople on Shikoku Island off western Japan , and her earliest memories are of observing artisans in their workshops. She remembers the blacksmiths most vividly. “They always had a fire next to them,” she recalls. “I remember the smell and sound of forging metal. Then there was the sound when the blacksmith struck the metal, when heat and light jumped out from under the hammer. The sparks!” To this day, the play and shimmer of light and shadow remain key to Ishiyama’s artistic aims. Years would pass before Ishiyama herself would work in metal she earned a B.A. in art history from Kanseigakuin University, Hyogo, Japan, in 1965-but the tap and clank of the smith’s hammer are constants in her work. “When I start hammering,” she says, “I can hear the rhythm of my- body. It’s like resting. For other people it’s noisy, hut for me it’s restful.” It is also key to her work. Ishiyama hammers to texture the surface of her metals, usually pounding silver against corrosion-pitted iron. She hammers to form her work. And she hammers to imbue the metal with the density and stiffness necessary to capture the delicate gestures she will force the metal to assume. Her designs demand that precious metals behave almost like copper or steel, maintaining their physical integrity in a variety of stressed shapes. She hammers and hammers thin sheets of silver and gold as if the energy of each blow could be stored in the metal’s memory as kinetic potential, as the iron discipline to endure in the shape she sets. Ishiyama abhors soldering “melting things together,” she says with distaste, preferring to shape rather than construct her pieces. Ishiyama began making jewelry soon after moving to New York in the mid-1980s. Her earliest jewelry designs involved releasing a form from a sheet of metal, as if the form were already implicit and just waiting to be liberated from its two-dimensional state. She continues to use the technique in her current design repertoire. In essence, she hammers sheet metal to produce the requisite tempering and to supply surface texture and detail. She then draws the three-dimensional form in a collapsed two-dimensional representation and uses a frame saw to cut out the details. Although she must still finish the edges, the form is nearly complete when she teases out the metal, pushing and pulling, tugging on points, until it expands to full shape like a butterfly shedding its chrysalis and unfolding its wings. The apparent spontaneity of these pieces produces an almost childlike delight. The forma seem to have sprung into existence almost effortlessly, and while it is true that the technical requirements of this design approach are not as taxing as other approaches to jewelry, they require a poetic sensibility to visualize how the finished piece can be coaxed from the metal. The straightforwardness of this technique does not limit the multiplicity of possible forms and effects. 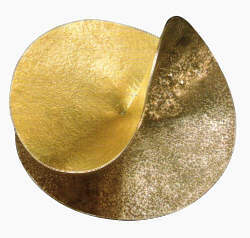 Two 1998 brooches employ a commercial bimetal of sterling silver and 18 karat gold. Ishiyama has also oxidized the silver to enhance the surface granulation. 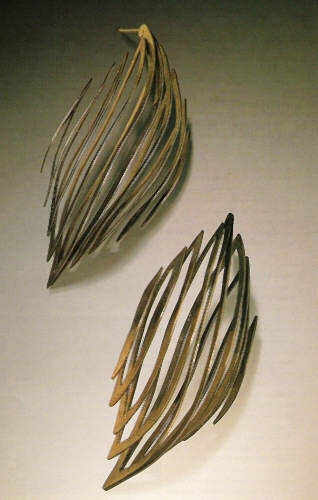 While one brooch expands front and back from a central axis its leaflike shapes producing a cascade of light and shadow akin to the dappled effect of sunlight shining through bamboo the other employs spiral forms with a single vector of movement, recalling a blossom rather than a leafy canopy. One technique–two very different effects. If the sprung cutouts illuminate the three-dimensional form inherent in the two-dimensional material, Ishiyama’s other approach to creating jewelry involves drawing in volumetric space with thin spiral strips of metal. By cutting the ribbons as spirals from a sheet of metal, she makes energy risible-in the way that a tornado becomes visible as the spinning motion gathers matter in its vectors. As she pulls the spirals into three-dimensional forms, Ishiyama is literally drawing vortices in the air. After appropriate hammering and surface treatment, Ishiyama shapes the strips into forms that might encircle the wrist, or attach with a pin as a brooch. Ishiyama creates the illusion that whatever form she may give the metal, it is only a transitive state. The fluidity of the forms and their seeming impermanence lends them a poignancy that is usually the realm of the natural world, where beauty must inevitably decay. Her brooches, bracelets, and neckpieces often look as if they could be deformed with the slightest pressure, or deconstructed to their original metal forms by pushing or pulling. 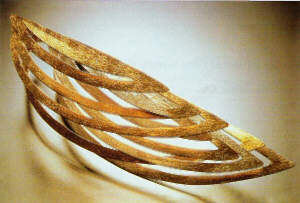 Yet they arc, in fact, sturdy and stable because the metal has been so work hardened. The impermanence is the artist’s illusion. Ishiyama’s dependence on the physical properties of metal allows her to make pieces virtually devoid of supporting architecture, keeping them light and kinetic. She sees jewelry as keyed to the body, and has aimed to make her pieces expressive and buoyant even from the outset. Jewelry marked a departure from her past. She did research on the traditional tea ceremony while in college and after graduation served a three-year apprenticeship with a metalsmith who created traditional tea ceremony utensils. Her apprenticeship was limited to surface design, but she discovered her own direction not in this traditional craft, but as a metal sculptor working on a large scale. In keeping with the Conceptual art direction of the Japanese art world in the 1970s and 1980s, she found herself thinking more and making less. “I wanted to go back to working just with my hands,” she explains. Referring to the ethic she learned as a child in a workshop village, she says solemnly, “It is very important to live with the hand.” Moving to New York made that possible. When she arrived in 1985, the street scene fascinated her. “It was as such a surprise,” she says. “I just saw people’s energy and independence, and I realized that I could really experiment” Inspired by some innovative jewelry she saw in a SoHo gallery, Ishiyama turned her sculptural skills to small-form work with saw, hammer, and files at a jeweler’s workbench making jewelry to match the lightness of spirit she found in New York . Apart from a three-month course at the Fashion Institute of Technology–which she took mostly to have a workbench and learn where to buy materials–Ishiyama is largely self-taught. The simplicity of her tools, techniques, and materials do not limit her artistry. Alchemists (at least in theory) worked with nothing more than air, earth, water, and fire. Hammer in hand, Ishiyama finds grace, movement, angle of momentum, and dynamic potential in simple strips or sheets of silver. She does so by designing directly in the metal, working it with her hands to find shapes and forms that complement the body. Her necklaces and bracelets take on forms that resemble vessels–eages to fit around parts of the anatomy. And all of the pieces, including brooches and earrings, display forms evocative of the natural world. 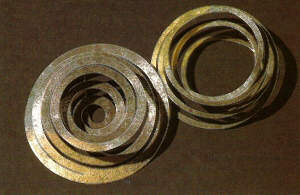 The sprung works, i.e., those that are opened from a sheet of metal, tend to follow the geometry of leaves and flowers. Her spiral bracelets, formed from spiral-cut long strips of metal, assume forms akin to lianas, girdling the arm in profuse swirls. The spiral works achieve an airy grace in which the metal describes elegant arcs in empty space, and the spaces between the arcs are as essential to the design as the metal itself. 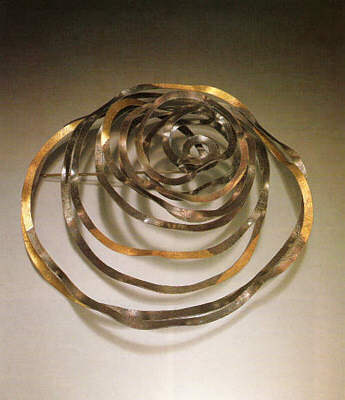 Ishiyama describes these works, which she began to make in 1997-98, as “freer” than some of her earlier, more solid pieces, where she was exploring forms in metal rather than in metal and air. For example, a stately 1996 brooch literally turns back on itself, an exploration of the “sides” of two-dimensional metal wrenched into three dimensions and enhanced by the application of gold leaf. Ishiyama describes herself as a production jeweler, although the label could be misleading. Each successful piece that she designs enters her permanent repertoire–much as a dancer builds a body of choreography that she or he can perform-but each time she remakes the piece, it will be somewhat different. She is, however, pragmatic. She does not establish a limit for a given piece, knowing only that “when it’s sold, I have to make another one.” She does produce one-of -a-kind jewelry, but views these pieces as long-term projects where she can experiment NN with techniques and concepts that will ultimately find their way into her production line. One of those technical experiments is very evident in the bracelets from 2001. 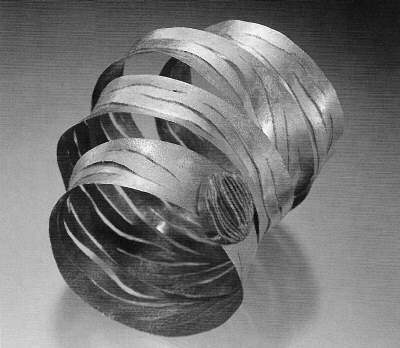 In many of her pieces, Ishiyama has relied on the curves inherent in narrow spiral-cut strips of metal, knowing that the width of the strips would allow her to have both flexibility and strength. These two pieces, however, use broader strips of metal, but with flexibility enhanced by cutting slashes or striations along the longest axis. The striations permit the metal to twist, producing a richly undulating surface and creating an effect akin to the bark of certain trees. In both pieces, Ishivama attaches contrasting details to the spiraled coils-such as gold bars or an oxidized sterling rosette that resembles the skeleton of a nutshell. She also joins the ends with rivets, a more satisfying mechanical solution to completing the form than soldering them together. The pieces point to Ishiyama’s strategy for evolving her work. Quite consciously, she has stripped her jewelry of artifice, letting the simple metal outshine the straightforward techniques. But she is constantly looking for ways to layer simplicity upon simplicity. The effect she creates is not so much minimalist as an exemplar of the aesthetic economy one might better call elegance. 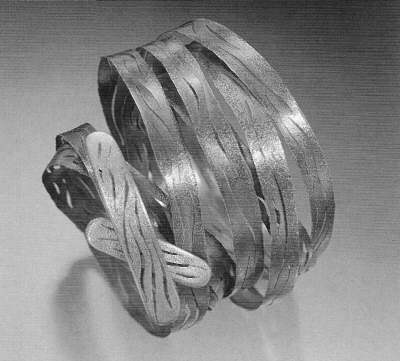 Writers and critics based in Cambridge, Massachusetts, Patricia Harris and David Lyon are frequent contributors to Metalsmith.